Semiconductor Engineering - Will Directed Self-Assembly Pattern 14nm DRAM? Semiconductor Engineering - Will Directed Self-Assembly Pattern 14nm DRAM? Home > Manufacturing, Packaging & Materials > Will Directed Self-Assembly Pattern 14nm DRAM? Comparisons between SAQP with DSA using virtual fabrication. Will directed self-assembly (DSA) join Extreme Ultraviolet (EUV) Lithography and next-generation multi-patterning techniques to pattern the next memory and logic technologies? Appealing to the wisdom of crowds, the organizers of the 2015 1st International DSA symposium recently surveyed the attendees. Nearly 75% believed DSA would insert into high-volume manufacturing within the next 5 years, with nearly 30% predicted insertion within the next 2 years. What is gating insertion? The crowd rated defectivity as the most critical issue facing DSA. This fact adds weight to memory being the first to be patterned with DSA. This is because, as Roel Gronheid from IMEC pointed out last month at the SPIE Advanced Lithography conference , memory chips can tolerate single failing cells through redundancy and so can could tolerate higher defectivity in patterning (roughly 1 defect/cm² compared to 0.01 defect/cm² for logic). Defectivity rates for DSA aren’t there yet (according to public information), but are rapidly approaching , . The next most important issue gating insertion was integration, according to the independent device manufacturers (IDMs) in the crowd at the symposium. In other words, how will replacing current patterning processes with DSA impact the overall device yield? To aid in answering this question, a team here at Coventor set out to quantitatively investigate this exact question for one yield-sensitive metric of a DRAM technology. We presented our progress last month at the SPIE Advanced Lithography conference. The slide presentation is available upon request, and the paper will appear soon . 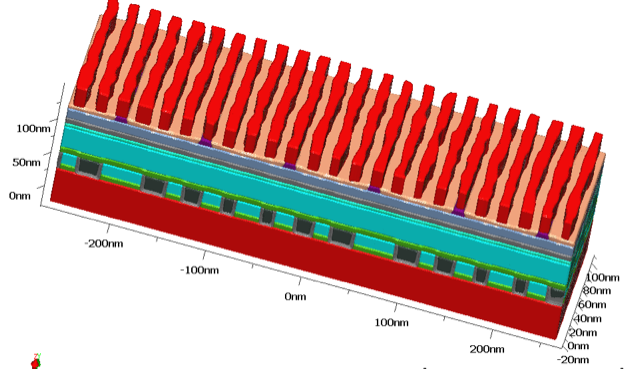 What we’ve done is to apply virtual fabrication to create a model of a 14nm DRAM technology based on publicly available data, projected linearly to 14nm dimensions. We examined two critical patterning levels with 193i multi-patterning vs. DSA and compared the impact on interface area between the transistor source/drain and the capacitor contact. This interface is created many steps after the patterning of the active area (see images below) and so would be very difficult to predict without fabrication (virtual or actual). In our standard 193i-based 14nm DRAM technology, the active area was patterned with Self-Aligned Quadruple Patterning (SAQP) and the capacitors with four passes of Litho-Etch (LE^4). We then created an alternate process flow and DRAM structure replacing the SAQP step with LiNe DSA  using 4x multiplication and replaced the hexagonally packed capacitor patterning with a DSA flow similar to . Impact from the active area patterning with DSA is shown in the figures below, and this article continues afterwards. The interface area as shown in the figures above is very non-planar and for SAQP varies greatly between adjacent contacts due to pitch walking. But how robust is it to process variation? To evaluate, we automatically created a series of 28 structures representing 2σ variation in lithographic exposure, deposition thickness, and over/under etch. Each structure took about 1 hour to build on a 4-core laptop computer. We then used virtual metrology to automatically measure the interface area. 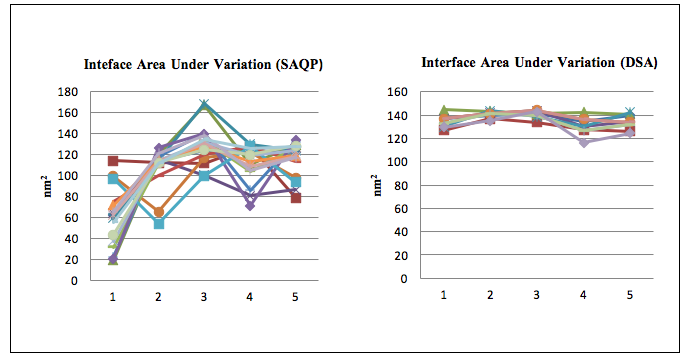 The result shown in the plots below shows far more variation for SAQP than DSA. This is largely expected since SAQP requires so many more process steps, each with its own variation. Another critical issue cited by the crowd was pattern roughness. DSA is known to suffer from higher levels of line-edge/line-width roughness (LER/LWR) than SAQP. My colleagues recently showed the evolution of LER/LWR through the SAQP flow at SPIE , and below you can see a figure of DSA LiNe with LER. Adding LER to the above study would enhance its accuracy and is a future topic. R. Gronheid, et al, “Opportunities and challenges for DSA in logic and memory (Invited),” presented at the SPIE Advanced Lithography, San Jose, CA, 2016. H. Pathangi, et al, “Defect mitigation and root cause studies in 14 nm half-pitch chemo-epitaxy directed self-assembly LiNe flow,” J. MicroNanolithography MEMS MOEMS, vol. 14, no. 3, 2015. M. Somervell, et al, “Driving DSA into volume manufacturing,” 2015, p. 94250Q. 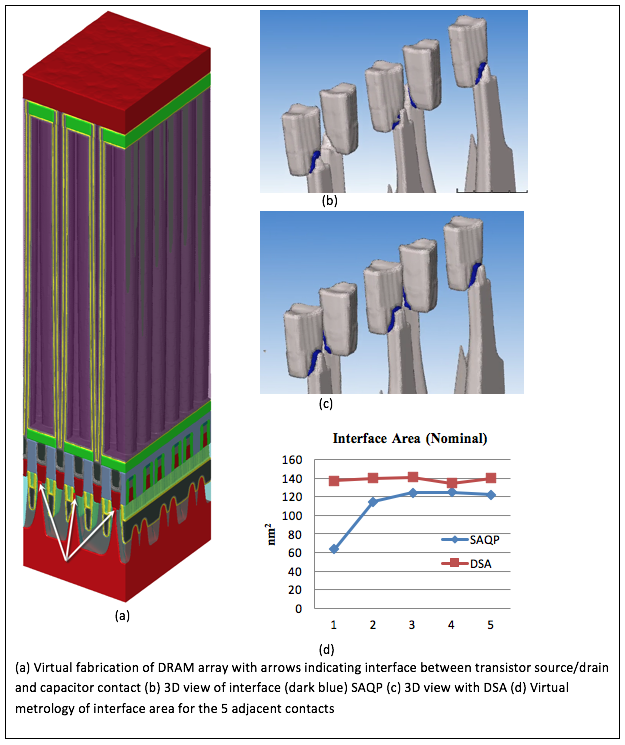 M. Kamon, et al, “Virtual fabrication using Directed Self-Assembly for process optimization in a 14nm DRAM,” in Proc. SPIE 9777, 2016. C.-C. Liu, et al, “Fabrication of Lithographically Defined Chemically Patterned Polymer Brushes and Mats,” Macromolecules, vol. 44, no. 7, pp. 1876–1885, Apr. 2011. J. Gu, D. Zhao, V. Allampalli, D. Faken, K. Greiner, and D. Fried, “Predicting LER and LWR in SAQP with 3D Virtual Fabrication,” in Proc. SPIE 9782, 2016. Mattan Kamon is Distinguished Technologist at Coventor, where he leads prototype and algorithm development for semiconductor process modeling. Before joining Coventor in 1997, he received his Ph.D. in electrical engineering and computer science from the Massachusetts Institute of Technology, where his research focused on fast algorithms for parasitic extraction of electrical interconnect. After joining Coventor he switched focus to numerical algorithm development for MEMS and semiconductor process modeling. His current projects include polymer modeling for directed self-assembly (DSA) and numerical methods for MEMS RF acoustic resonator simulation. Hope that 7nm will sustain SDA method.